The Russian-born, Paris-based Werner brothers, Michel and Eugene, were among motorcycist's greatest pioneers. 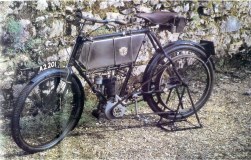 Their first 217cc single, produced from 1898 onwards was light and practical and sold well. But the Werners are chiefly remembered for the innovative 1901 model New Werner, whose layout, with the engine set low in a diamond-style bicycle frame, greatly improved handling and set the pattern for years to come. In 1902, the inventive Brother introduced a new model, with engine conventionally mounted in the frame and, this time, the rear wheel being driven by a flat-belt. One of these Werners was ridden by pioneer biker E H Arnott from Lands End to John O'Groats in under 66 hours. For 1904, a V-belt replaced the flat type. Werners were made up to 1908.